In collaboration with: The IDEA Center (University at Buffalo), Toronto Rehab Institute, and the Centre for Sight Enhancement (University of Waterloo). While older adults with dementia (e.g. Alzheimer’s disease) generally have impairments in short-term memory and reasoning capabilities (and thus encounter tremendous difficulties in learning a new task and/or adapting to a new environment), long-term memory and implicit memory are often relatively spared. Therefore, it is believed that products designed for this population should reflect ingrained and well-learned skills by incorporating features that are recognizable or familiar to users based on their previous experiences. This concept of familiarity and its impact on helping older adults with dementia preserve independent functioning have been extensively explored in architectural and environmental design, but have not received much attention within the field of universal design of products. This project, a subproject of a large RERC (funded by NIDRR) focusing on Universal Design and the Built Environment, will provide insights into the impact of familiarity in the design of everyday products for older adults with a cognitive impairment. In particular, this project will examine how different types of water faucets influence the abilities of older adults with dementia during the task of hand washing. The impact of familiarity will be studied with older adults, both with and without a cognitive impairment, through the comparison of various usability measures (e.g. task completion rate and time, error rate and type, learning and relearning time, satisfaction, etc.). A baseline (familiar) faucet design (a traditional dual knob with single spout) will be compared with a series of alternative (unfamiliar) designs (dual lever, single lever, automatic with an electronic eye and a faucet design targeted at the dementia population - turning on the water by touching a plastic wand under the faucet). A within-subjects design will be used in which every subject will be tested with the baseline faucet design and the four intervention designs. 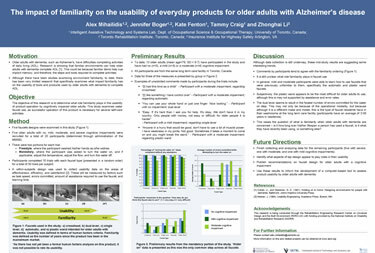 It is hoped that insights will be gained through this study on how aspects of design, such as familiarity and intuitiveness, can be used to inform guidelines for water faucets and other related hardware and controls, as well as shedding light on the universal design of everyday products that support older adults with a cognitive impairment. One of the challenges in conducting a usability study with people who have a cognitive impairment is how to effectively collect reliable data from this population. Traditional usability data collection techniques such as simulations, interviews, focus groups, and analytical methods may not appropriate as cognitive impairments may restrict an individual’s ability to provide reliable responses. Therefore, it is hoped that this study will also provide insights on what and how human factors, usability tools, and methods can be used or adapted for usability studies with this population. With the first half of the study complete, the team presented prelimianry results to the Chicago ICAD conference in July, 2008.